This is me and my Dad. 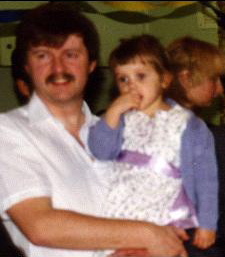 I think this was taken at my Grandma and Grandad’s Wedding Anniversary party when I was about 3 or 4 (as my brother also appears in the larger version of this picture). There’s a particular story that he tells about when I was young. My Mum would take care of the house and my Dad looked after the garden – including cutting the grass, well the garden at my parents takes up quite a big bit of the garden. Well this one particular time he was out cutting the grass and I ran out into the garden in floods of tears – my Dad thought I’d hurt myself and I was in such a state that I couldn’t really string the sentence together. Anyway, I was crying about the fact that as Dad cut the grass he was cutting the heads of the daisies! Trust me to freak out over that lol.